After consultation with members of the editorial board, following are the 10 best clinical articles of 2003. During the year, many innovative and informative publications appeared in surgical and medical journals. Our selections appear in random order. We hope that this list will prove helpful to you in staying abreast of significant practice-related ideas. Each article is preceded by a comment regarding the reason it was chosen. Some observational studies have suggested that the use of pulmonary-artery catheters to guide therapy is associated with increased mortality. This is particularly true, so the reasoning goes, in high-risk surgical patients requiring an intensive care setting. The following report of almost 2000 patients helps to establish the concept. Sandham JD, Hull RD, Brant RF, et al. A Randomized, Controlled Trial of the Use of Pulmonary-Artery Catheters in High-Risk Surgical PatientsN Engl J Med. 2003;348:5-14. The study was performed in high-risk patients, 60 years and older, American Society of Anesthesiologists (ASA) class III or IV, who were scheduled for urgent or elective major surgery followed by a stay in an intensive care unit. The primary outcome was in-hospital mortality from any cause and was adjudicated by observers who were unaware of the treatment group assignments. Of the 1994 patients involved, equally divided, about 7.7% died in the hospital, and the pulmonary-artery catheter group had a significantly higher rate of pulmonary embolism. Thus, no benefit appeared to be derived by placing the catheter over the standard care in this group of high-risk patients. Much has been written by Shoemaker and his group regarding supranormal trauma resuscitation. Although many have refuted his statements, this article, monitored in every way possible, reports that supranormal resuscitation required more lactated Ringer infusion, decreased intestinal perfusion, and increased the incidence of abdominal compartment syndrome, as well as increased multiple organ failure and death. Balogh Z, McKinley BA, Cocanour CS, et al. Supranormal Trauma Resuscitation Causes More Cases of Abdominal Compartment SyndromeArch Surg. 2003;138:637-642. Patients with major trauma (injury severity score >15), an initial base deficit of 6 mEq/L or higher, or the need for 6 U or more of packed red blood cells in the first 12 hours or patients 65 years and older with any 2 of the previous criteria were monitored and resuscitated with lactated Ringer infusion and/or packed red blood cell transfusion and moderate inotrope support, as needed, in that sequence, to attain and maintain an oxygen delivery index greater than 600 mL/min per square meter or equal to 500 mL/min per square meter for the first 24 hours in the intensive care unit. Thus, they determined that the supranormal resuscitation was associated with increased lactated Ringer infusion, decreased intestinal perfusion, and an increased incidence of intra-abdominal hypertension, abdominal compartment syndrome, multiple organ failure, and death. During the past several years, there have been many articles praising the sentinel-node biopsy as the correct procedure for examining the axillary nodes and their status in applying chemotherapy to an individual patient. This article presents facts regarding the efficacy and safety of sentinel-node biopsy. Veronesi U, Paganelli G, Viale G, et al. A Randomized Comparison of Sentinel-Node Biopsy with Routine Axillary Dissection in Breast CancerN Engl J Med. 2003;349:546-553. Five hundred sixteen patients with primary breast cancer in whom the tumor was less than or equal to 2 cm in diameter were assigned randomly to either sentinel-node biopsy and total axillary dissection or to sentinel-node biopsy followed by axillary dissection only if the sentinel node contained metastases. The sentinel node, found equally in the 2 groups, was positive in 83 (32.3%) of 257 patients in the mandatory axillary dissection group and in 92 (35.5%) of the 259 patients in the axillary dissection if sentinel-node biopsy results were positive group. The overall accuracy of finding the sentinel node was 96.9%; the sensitivity, 91.2%; and the specificity, 100%. There was less pain and better arm mobility in those who underwent only sentinel-node biopsy. No cases of overt axillary metastasis occurred during the follow-up of 60 months. Thus, sentinel-node biopsy is a safe and accurate method of screening the axillary nodes for metastasis in women with a small breast cancer. Surgeons have long debated the routine use of intraoperative cholangiography (IOC) during laparoscopic cholecystectomy. Recent population-based studies have demonstrated that the use of IOC is associated with a decrease in the rate of common bile duct injury. To understand the cost implications of routine IOC, the following study was done. Flum DR, Flowers C, Veenstra DL. A Cost-Effectiveness Analysis of Intraoperative Cholangiography in the Prevention of Bile Duct Injury During Laparoscopic CholecystectomyJ Am Coll Surg. 2003;196:385-393. Using base-case estimates, management of patients undergoing laparoscopic cholecystectomy with routine IOC would cost $100 or more per case. Routine IOC would present 2.5 deaths per 10 000 patients at a cost of $390 000 per life saved. The cost per common bile duct injury avoided with IOC use is $87 143. Thus, the routine use of IOC seems justified especially among less experienced surgeons and in high-risk operations. There have been a rash of articles relating to the nonoperative management of solid organ injuries. Many have adopted this form of therapy for splenic, kidney, and liver trauma, but there is always a group of therapists who wonder whether this treatment is best. The following study, we believe, points out the success of this nonoperative plan. Velmahos GC, Toutouzas K, Radin R, et al. High Success with Nonoperative Management of Blunt Hepatic TraumaArch Surg. 2003;138:475-480. This Southern California trauma group, across a 26-month period, saw 78 consecutive unselected patients with liver injuries. In the absence of hemodynamic instability or signs of hollow visceral trauma, nonoperative management of the liver injury (NOMLI) was offered. The success rate of NOMLI was 85%, but the liver-specific success rate was 100% (several patients were operated on for other reasons within the abdomen). No adverse events were attributed to NOMLI. Thus, they concluded that NOMLI is safe and effective regardless of the grade of liver injury. All of the discussors, trauma experts, agreed. Sepsis and organ dysfunction are common and are considered to be important complications of burn trauma. This article sought to define the relationships between sepsis, severe multiple organ dysfunction (MOD), and death after burn trauma. Fitzwater J, Purdue GF, Hunt JL, et al. The Risk Factors and Time Course of Sepsis and Organ Dysfunction After Burn TraumaJ Trauma. 2003;54:959-966. For the past 12 years, more and more endovascular stent grafts have been used to repair aortic aneurysms. It is imperative that we look at the results of this effort for this is the wave of the future. Marin ML, Hollier LH, Ellozy SH, et al. Endovascular Stent Graft Repair of Abdominal and Thoracic Aortic Aneurysms—A 10-Year Experience with 817 PatientsAnn Surg. 2003;238:586-595. Abdominal (AAA) or thoracic (TAA) aortic aneurysms are a significant health concern treated traditionally by open surgical repair. With the advent of endovascular stent grafts we are seeing protection from rupture with a reduction in procedural morbidity and mortality. During a 10-year period, the authors treated 817 patients with endovascular grafts (AAA = 723, TAA = 94), with the results as follows: technical success on an intent-to-treat basis was 93.8%, primary clinical success (freedom from aneurysm-related death, type I or III endoleak, graft infection or thrombosis, rupture or conversion to open repair) was approximately two thirds at 8 years with at least 98% freedom from aneurysm rupture at 9 years. There was a 2.3% incidence of perioperative mortality. Thus, it was concluded that endovascular stent graft therapy is a valuable alternative to open aortic repair, especially in older, sicker patients with large aneurysms. Continued device improvement coupled with an enhanced understanding of the important role of aortic pathologic features in determining therapeutic success will eventually permit endovascular stent grafts to be a more durable treatment of aortic aneurysms. Patients with Barrett esophagus (BE) are frequently offered laparoscopic antireflux surgery (LARS) to treat symptoms. The effectiveness of this operation with regard to symptoms and to the evolution of the Barrett epithelium remains controversial. Does it cause regression? This article provides one view. Oelschlager BK, Berreca M, Chang L, et al. Clinical and Pathologic Response of Barrett's Esophagus to Laparoscopic Antireflux SurgeryAnn Surg. 2003;236:458-466. This article analyzes the course of 106 patients with BE who underwent LARS during a 6-year period ending in 2000. Various numbers of patients agreed to manometry and 24-hour pH monitoring, endoscopy, and histologic evaluation of biopsy material to determine progression or regression of their BE. Symptoms improved in 70% to 96% of cases. Short-segment BE improved or disappeared in more than 50% of those cases, but LARS did not affect those with long-segment BE. Among patients with complete regression, 89% of those tested had normal esophageal acid exposure. Only 1 patient developed adenocarcinoma within 10 months of LARS. Thus, it was concluded that LARS, while not perfect, is the most effective treatment of patients with BE. Typical reflux symptoms improve and an efficient barrier at the gastroesophageal junction was restored. More than 50% of patients with short-segment BE had it eliminated by operation, and the progression from metaplasia to dysplasia or cancer was rare. We know that obesity surgery can lower blood sugar and thus reverse type 2 diabetes mellitus. What we need to know are the long-term effects of gastric bypass on type 2 diabetes. Schauer PR, Burguera B, Ikraduddin S, et al. Effect of Laparoscopic Roux-en-Y Gastric Bypass on Type 2 Diabetes MellitusAnn Surg. 2003;238:467-485. This article evaluates preoperative and postoperative data in all patients with impaired fasting glucose and type 2 diabetes mellitus (T2DM) undergoing laparoscopic Roux-en-Y gastric bypass (LRYGBP) for 5 years ending in 2002 (240 patients [21%]). With a mean loss of 44 kg (97 lb), fasting glucose levels and glycosylated hemoglobin concentrations returned to normal (83%) or markedly improved (17%) in all patients. A significant reduction in insulin levels and oral antidiabetic agents was noted. 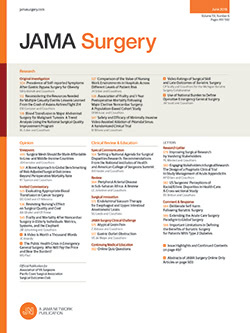 Thus, it was concluded that with the operation resulting in significant weight loss (60% of excess body weight loss), there was a resolution of T2DM in 83% of patients, and those with the shortest duration and mildest forms of T2DM had a higher rate of resolution, suggesting that early surgical intervention is warranted to increase the likelihood of rendering the patient euglycemic. After trauma, whether from an external source or operation, up to 60% of immobilized patients have been reported to develop a silent deep vein thrombosis. No effective therapy has been submitted to a large, prospective randomized trial. This effort to test the effectiveness of intermittent pneumatic compression devices in these patients is therefore important. Ginzburg E, Cohn SM, Lopez J, et al. Randomized Clinical Trial of Intermittent Pneumatic Compression and Low Molecular Weight Heparin in TraumaBr J Surg. 2003;90:1338-1344. A prospective, randomized trial was performed on 442 patients who received thromboprophylaxis using either intermittent pneumatic compression or low-molecular-weight heparin. The results indicated no significant difference in time spent in intensive care or the proportion of patients with spinal cord or head injuries or pelvic fractures. Pulmonary embolism occurred in 1 patient in each group. None of the major bleeding episodes required operative intervention. Thus, the low rate of thromboembolic complications and the cost savings suggest that intermittent pneumatic compression might be used safely and effectively for thromboprophylaxis in trauma patients. Correspondence: Gerald W. Peskin, MD, Archives of Surgery, 1411 E 31st St, Oakland, CA 94602 (archsurg@jama-archives.org).